We understand that graduate study can be an intense experience and our support within the College community ensures that you can focus fully on your studies while we take care of your day to day needs. Living at University College gives you the opportunity to belong to a friendly, relaxed and supportive community where everybody knows each other. UC’s greatest asset is its people. We’re proud when students say they feel at home as soon as they walk through our doors. Undergraduate students, graduate students, resident tutors and staff all know each other by name, and there is genuine care and support for each other. Life as a UC graduate student is a rewarding, engaging and inspiring experience. Being part of a college community within a large university offers you the opportunity to make friendships with other like-minded graduate students from around the world. All graduate student accommodation features large modern rooms and ensuite bathrooms. Although all meals (21 meals per week) are provided, there are excellent facilities to cook for yourself and your friends in the well-equipped kitchens adjacent to the graduate lounges, when time permits or the occasion arises. As members of the Senior Common Room, graduate members of the college community enjoy participation in the academic life of the College. There are High Table dinners, career-oriented workshops, seminars and fireside chats as well as the opportunity to mix with the many distinguished scholars who stay in our 14 apartments for visiting academics. Academic support is available through the College’s consultation and tutorial program, while there is also the opportunity to earn income as a tutor by giving tutorials and consultations in your area of expertise to our undergraduate students. Many graduate students also appreciate a break from study. 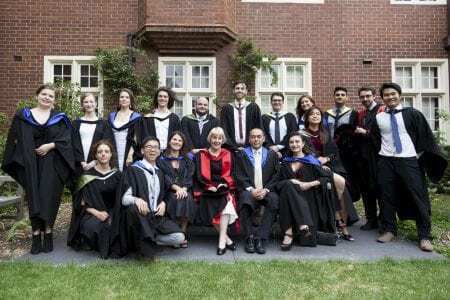 The college offers a range of activities for graduate students to explore the many cultural and culinary delights that a vibrant and sophisticated city like Melbourne has to offer. Opportunities abound and include sporting, musical, dramatic, artistic and social activities.